Bring all new flavors to your specialty drink menu with this Torani coconut flavoring syrup! This tempting flavor will complement your beverages without overpowering them or being too sweet, while the user-friendly bottle will be convenient for your busy baristas to use. Torani flavoring syrups are specially formulated to resist curdling in milk and to hold up well under heat, making them the perfect choice for espresso-based drinks, brewed coffee or tea, and more. Use this flavor for frappes, iced coffees, smoothies, and even baking! I really like the taste of this coconut flavor. Depending on what you are adding to it can be a little light. I put it in lemonade which has a strong flavor and it took me a lot of pumps for the coconut flavor to come through. This coconut syrup is the best for flavoring drinks or even adding to coffee. It doesn’t have an overwhelming taste. Comes in a nice glass bottle. Subtle coconut flavor for all your beverage needs. Great when mixed into whipped topping for a c oh count flavor on top of frozen or hot drinks. We use this flavoring syrup in our drinks at the coffee bar in our café. It has great flavor and our guest really enjoy it! Torani Coconut Syrup is awesome! We add it to our coffees, lattes and smoothies. It is great with the Torani Dark Chocolate sauce to make the perfect Coconut Mocha! Hands down the best flavoring syrup for the money. If you are not offering flavoring syrup for coffee then you are missing extra extra sales. Minimum investment with high return. This syrup has a great coconut flavor with just the right amount of sweetness. Our latest concoction is a blackberry coconut frappe with green white chocolate drizzle we named the mermaid. Are you looking for a coconut syrup that is good quality and tastes like actual coconut and not just a bunch of sugar? This is for you! We love this syrup. Very good and accurate flavor, great for tropical drinks. I usually use this when making pina colada flavored drinks, all you have to do is add pineapple flavoring and you're good. This syrup is so good!! I used it to make a frozen coffee and it was the bomb! It tastes like being at the beach and mixes incredibly well with coffee. So this flavor is a great ttasting coconut without tasting fake and like suntan lotion (like many coconut flavored things do) I love putting this into coffee and teas as well as adding it to milk or shakes. Coconut syrup is a staple in my personal soda bar. I love coconut with pineapple, cherry, strawberry, coconut, rose, you name it. My favorite is pineapple though, the pina colada flavor is delicious! I love Torani flavoring syrups. The Coconut flavor is delicious and blends well into creamy thick milkshakes, sodas and coffees. It adds a light flavor! Perfect price and perfect flavor. Many people order this in their daily coffee so we have to keep it on stock. Key ingredient to make a almond joy drink! A really nice coconut flavoring syrup with a great tropical taste and smell. It is perfect for making almond joy themed coffees and milkshakes at our diner. Not something you would always expect in a café, but our customers love it! Is great with just a little cream for a summertime Coconut Coldbrew! This is one of my favorite flavors of all time! I put coconut in everything - i especially love this in diet coke with a bit of cream. Delicious! Delicious flavoring in coffee, but not artificial tasting. You only need about one to two pumps in a 16 oz cup of coffee for the perfect blend, very good in ice coffee. A great tasting coconut syrup that is great for making our coconut cream pie milkshake. The syrup is really flavorful and a great way to add rich, coconut flavor to any dish quickly. This is by far the best coconut syrup I have tasted. It has an amazing coconut flavor. If you love Pina Coladas, mix this with the Torani Pineapple Syrup and you will feel like you are in the islands enjoying a relaxing beach vacation. This is great with pineapple in Italian Soads and we also use it with mocha to make a snowball that is great hot or iced. I've gotta say, even though this flavor's a little weaker compared to the more pungent fruity syrups from Torani, it still managed to surpass my expectations; use it a little more liberally than other flavors and you'll be golden. This syrup's so simple and sweet, and pairs beautifully with other flavors like Lime, Pineapple, or even something more complex like Coffee Liqueur. The best part's that this can be used for both italian sodas AND coffee drinks. This syrup is SO yummy. I love coconut! This syrup exceeded my expectations of a coconut flavored syrup. It's not too strong and not too faint. Great price and flavor. Always a consistent and dependable product for us to use in our smoothies for that island flavor in our pineaplle paradise paradee. Put me on a beach with any drink with the coconut flavor in it and I would be a happy girl! The flavor can be subtle or strong depending on the taste, but it adds a tropical hint to our fruit tea...and our customers love it! ?? Great starter syrup for any restaurant or bar. When it comes to coconut recepies or coconut based drinks, this is a great option to consider. One of our top selling drinks contains the Torani Coconut syrup. I never have to worry about the consistency of the Torani products. They have long lasting shelf life and high quality flavors. Torani is one of my most favorite brands- Most of the extracts we get through bigger companies that do our bulk orders- are not as great at these brands, these do not have a weird aftertaste, and work very well with frostings, batters and chocolates! Would highly recommend this flavor. We add this to our German Chocolate frosting, to really highlight the toasted coconut in the filling! This flavoring is a good quality and great for making almond Joy lattes – the coconut part. We don't use it often but it is something we keep on hand for any specialty drinks requested. I Recommend having it. I make my Lattes with coconut milk and add in this coconut flavoring for more sweetness and flavor. I also add it in my regular coffee. I never tried with regular milk so couldn't say if it curdles or not. The flavor is not overwhelming. Its more of a sugar based than flavor based. Coconut is not a strong flavor anyways do it's perfect for me. Oh, my Webster! I just made my first Coconut Dragon Fizz (Italian Creme Soda). A-Mazing! Two shots of Torani coconut syrup, 8 oz seltzer, stir, add ice, top with 2 oz heavy cream. Watch it fizz, and drink up. I make a drink using grain alcohol called Island Fantasy. I use Pineapple juice along with coconut water and other ingredients. I use this to enhance the flavor since the coconut water is not very potent. This does the job and produces a great drink. I love to make coconut flavored coffee, and this makes it perfect every time! I also use it on desserts! This is the best syrup! After sampling the coconut flavor we fell in love. Makes a great addition the the menu as well something to talk about. We love it. Absolutely one of our favorite Torani Branded syrups! It tastes every bit like coconut water, yet when added to other liquids and mixed goods it stands out like no other flavor! The coconut syrup smells and tastes delicious. We use this as an added boost to pina coladas and coffees. It is light enough while giving flavor. When added with coconut shavings, this syrup makes a very tasty coconut cake! It is very fragrant and the flavor cuts nicely, even through chocolate batter! We've done so many combinations with this flavor its awesome. Our favorite is German chocolate cake. Its chocolate, coconut, cupcake. Tastes fantastic! Love this product. The Torani coconut syrup is a stable for sure. Great for baking and specialty drinks. Sometimes you just need that dark chocolate, caramel, and coconut frappe! Perfect all by itself or paired with any number of other sauces and syrups for unique latte flavors that our customers keep coming back for! Best coconut syrup you can get! I love coconut, especially a coconut cold brew coffee. I've tried at least 4 different coconut syrups from different companies, some were super weak, some tasted like coconut milk, too heavy. Torani's coconut is pure, clean coconut flavor, no artificial taste. Perfect! We love the coconut Torani Syrup. It has a great rich coconut flavor. It makes great lattes, and of course our German Chocolate with Chocolate, coconut, and a little hazelnut! It's awesome! We love almost all the Torani syrups! They pour well, taste good, blend into drinks well, and are DELICIOUS! Put them in tea, coffee, Italian sodas - whatever you like, it doesn't matter, they are great. We wouldn't use any other kind! This coconut tastes like real coconut, not like a lot of things that you find that taste like fake coconut flavoring. A fan favorite! Mmmm. I love Torani Coconut Syrup! It smells and tastes WONDERFUL! Just opening the bottle makes you want to swoon with pleasure as the aroma fills the air. Even better, it tastes as good as it smells! I have found so many different uses. Just a dash adds a tropical flair to my morning smoothie (it helps cover up the unsweetened protein powder). It's lovely and refreshing when added to shaved ice. I've added a dollop to fruit crumbles to offset the sourness. Of course it's wonderful in coffee & hot cocoa. I like to mix it with other Torani flavors and homemade seltzer to make my own relatively healthy artisan sodas. The prices on Torani Syrups are amazing! Why pay twice as much at the regular store when you can get them here for half the price! Mix a shot of the coconut syrup with a shot of almond syrup and a drizzle of chocolate sauce and you have got a goldmine on your hands!!! We love the coconut flavored Torani. As soon as you open the bottle its a burst of coconut. The coconut Torani doesn't taste fake or like imitation coconut. We enjoy using this product because of the high quality of the syrup. This smell is sooooo tropical and makes you instantly love it, if you are a coconut lover like me. I use this in cookies and iced coffee. It is excellent quality and flavor that everyone in my house loves. This brand is also very trusted! Love It. Don't know how I lived with out it. Makes break time a great time. No more running out hoping the line at the sip it shop isn't to long. Strange but true, coffee and coconut is a great pairing, even better with some Torani French Vanilla added. There are a multitude of syrups you can mix to make a great tasting coconut drink. Heck, even coconut white hot chocolates are yummy. Try one! Coconut is great with chocolate and almond. It makes a great latte and for the price how can you go wrong. This is cheapest I've seen on line! This is a good choice year-round. It is reminiscent of real coconut and smells great. A really good addition after your basic French vanilla, caramel, etc. Torani Coconut syrup and sodas like Coca-Cola were a match made in heaven. We sell this at our business and it is one of our most popular refreshment options. Nothing like a refreshing coke with a tropical twist. Thanks Torani and thank you webstaurant for the good prices. 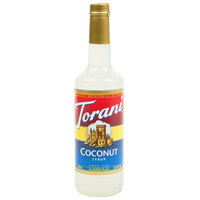 Torani Coconut is one of our favorite syrups. It is a wonderful addition to coffee drinks, tropical cocktails and smoothies and Italian sodas. We even use it to make coconut rice! Torani Coconut Syrup adds a burst of the right flavor to any beverage. We love its flavor and its ability to complement many of the drinks we sell at our business. Our coconut loving customers love this syrup! We use it in several signature drinks as well as just to flavor a cup of brewed coffee from time to time. We love Torani coconut syrup! We use it in many of our espresso specialty recipes and the customers love it! Great price, great products! Keep up the good work! We use this often when making almond joy lattés. Its a great mix with chocolate and almond as well. Torani syrups always have a great taste.